Hello, friends! 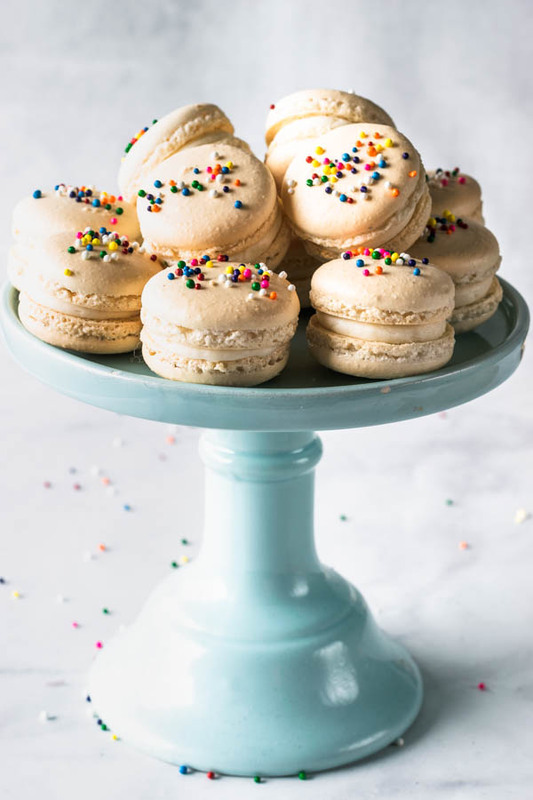 Check out my Funfetti Macarons! 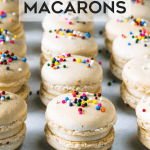 They are basically the simplest macarons in the world. Except that they have sprinkles on top. So they are superior, even without trying. 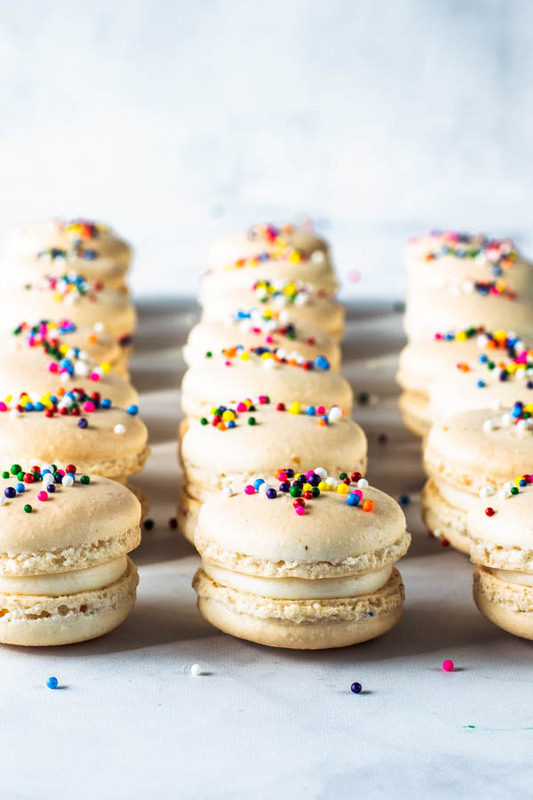 These Funfetti Macarons are really just vanilla flavored macarons. I did a simple Cream Cheese Frosting for the filling, because as you know, it’s my favorite taste wise. 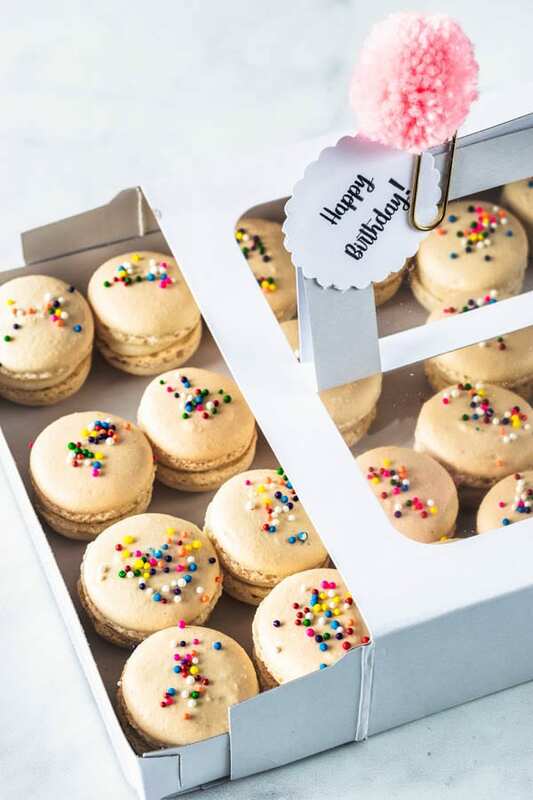 Whatever you may want to call it, Funfetti Macarons, Confetti Macarons, or Birthday Macarons, the important part is having sprinkles on them. 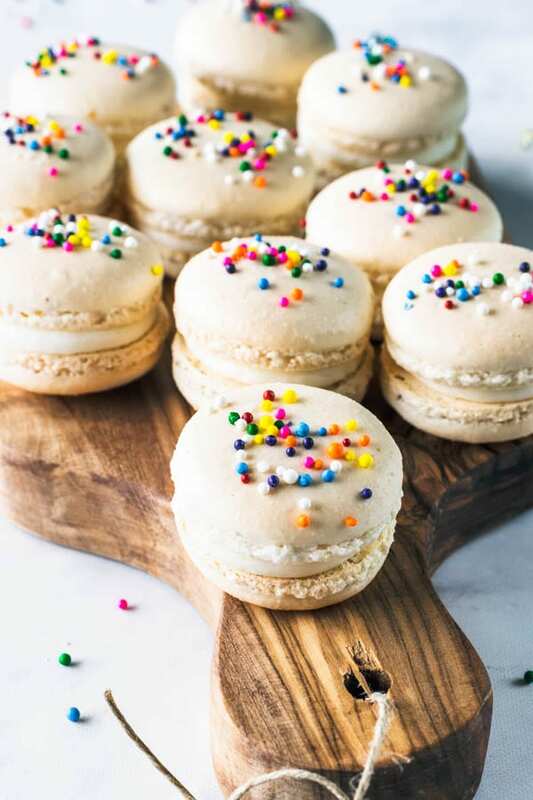 I’ve made Funfetti Macarons before, and once I added sprinkles to the actual batter, but I felt like they gave the macarons a “dirty” color, with all the sprinkles melting and mixing in the batter. So I opted this time to just sprinkle some on top of the shells before baking. 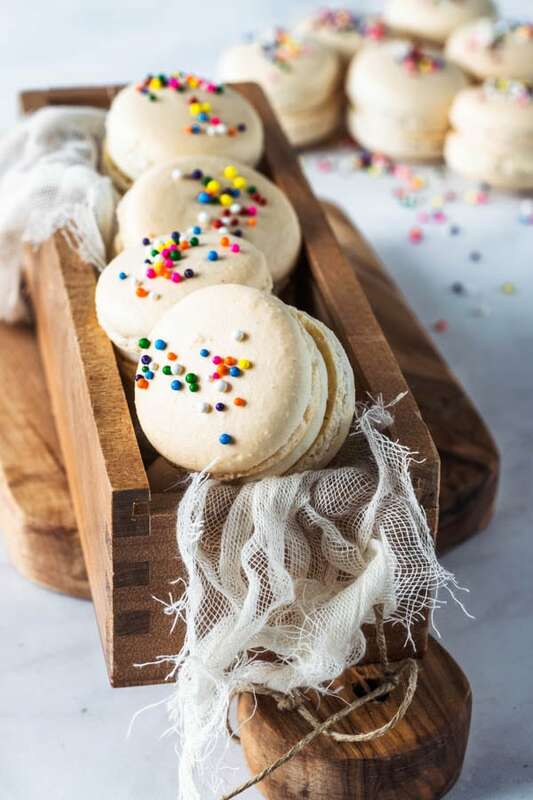 Yes, you want to sprinkle them on top of the shells before baking, and also before letting your macarons dry. 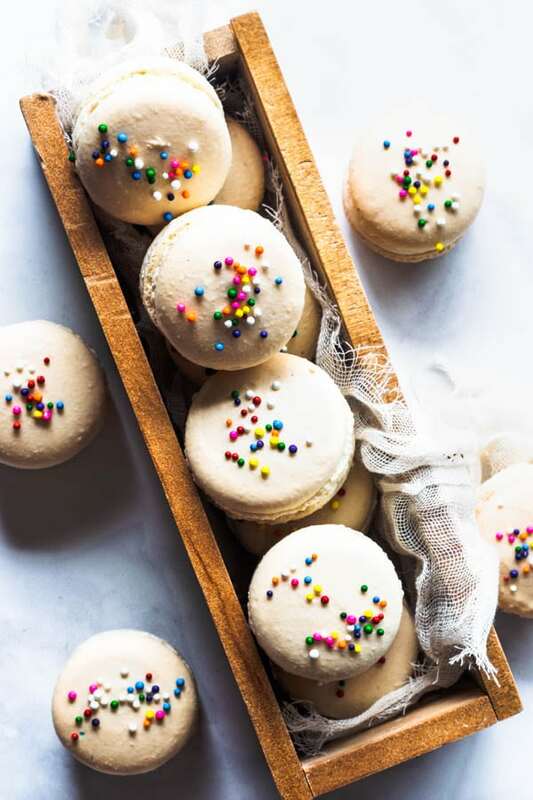 As soon as you finish piping your macarons, and then banging your trays against the counter, you can sprinkle them with the sprinkles of your choice. These are the sprinkles I use, by Wilton. Can’t go wrong with the classics. But you can use whatever sprinkles you like. Get creative. You can even color the Funfetti Macaron batter with any food coloring of choice. Remember to use gel food colorings, and don’t add too much of it. You don’t want to add water based food coloring to your macarons, as it may mess up with the structure of your macarons. And, it also happened to be a friend’s birthday that week. Homemade food gifts are my jam in life! There is nothing that I like more than making treats and sharing. Ok, there might be some stuff that I like more than that, but it’s probably just a handful of things. Baking and sharing is definitely top 5 favorite things to do. Just sharing in general, it’s something that usually fills your heart. I am a firm believer of only putting good energy out there in the world. And sharing is a super positive action that will definitely radiate good energy into the Universe. I once was a very negative person, with an addiction to complaining. I suffered from depression for years and years. 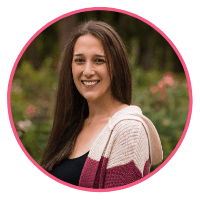 But something shifted a while ago and I began a self-love journey. I’ve been trying to eliminate from my life, actions that disempower me. And I have been trying even harder, to double down on actions that will make me feel empowered and happy. Anyway, sometimes these actions come in the form of macaron boxes. 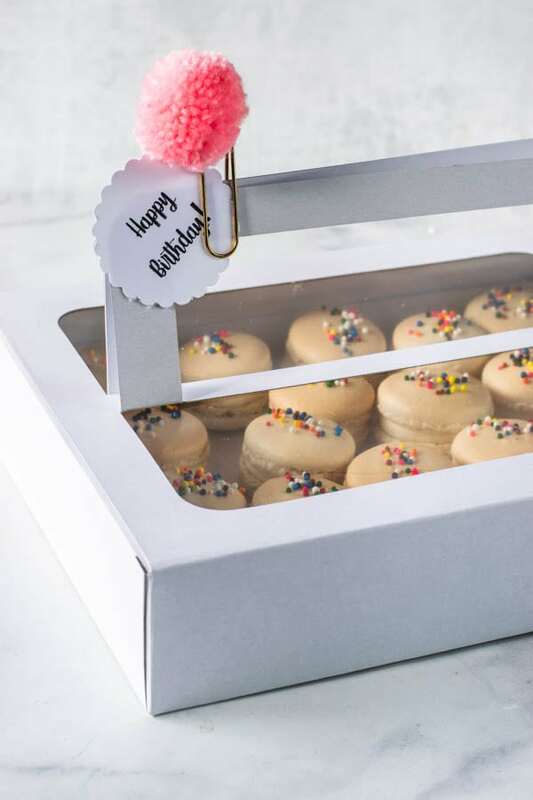 If you like Sprinkles, check out these other recipes: Sprinkles White Chocolate Truffles, Birthday Cupcakes with Sprinkles, Birthday Sprinkles Cake. About making the Funfetti Macarons. 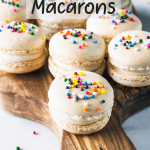 My recipe bellow is very detailed, however I have lots of posts with tips for making macarons. As always, thank you so much for being here and reading my blog. I am so grateful to be a part of this amazing community! Ps. Check out Sweet & Savory by Shinee’s Funfetti Macaron recipe, which was my first inspiration to make this. 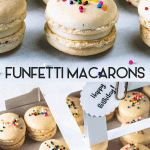 Funfetti Macarons, birthday macarons, or confetti macarons. Whatever you may call it. Here they are, in all their glory! Start folding gently forming a letter J with a spatula. Add the food coloring at this point, if using any (I didn’t). Once the batter spreads out very slightly and starts to look glossy on the parchment paper, I transfer my mixture to the piping bag. This is the most important part about making macarons. 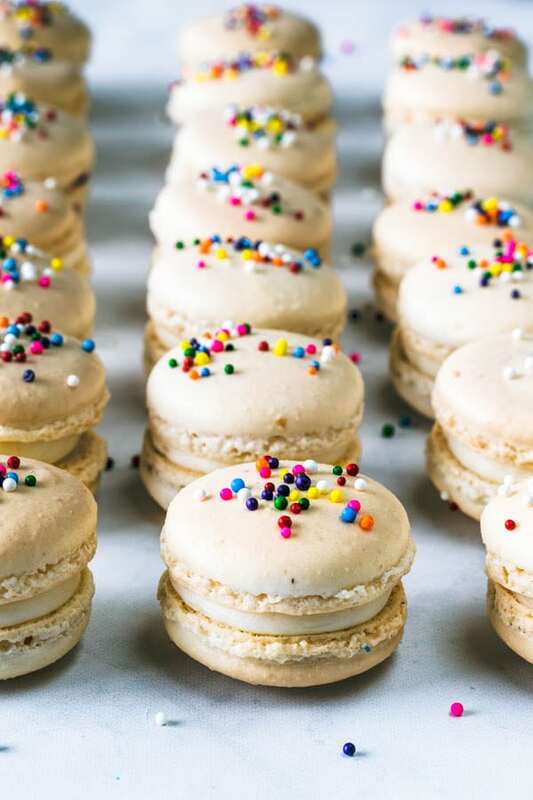 Sprinkle your sprinkles of choice over macaron shells, I only sprinkled half of mine, so the bottom shells of the assembled sandwiches wouldn’t have any sprinkles on them. Cream butter and cream cheese at medium speed in the bowl of an electric mixer for about 1 minute. With the mixer off, add all of the powdered sugar in. On low speed, beat the sugar, butter and cream cheese together. Once they are incorporated, turn speed to medium and cream for 1-2 minutes until very fluffy. Add vanilla in, beat for a another 30-45 seconds. If Frosting seems too thick, add a teaspoon of milk to thin it out. If it seems too thin, add a bit more sifted powdered sugar to make it stiffer. Quanto capricho e dedicação Ca, parabéns!!!!! These are super fun Camila! 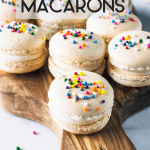 You have so many great macaron recipes! Love how you photographed these! Oooh these look like mini birthday cakes! Yeah, sprinkles make everything better! don’t they!!! Thank you Patrick! 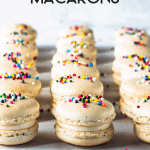 These macarons look amazing! So cute and perfect for birthdays!